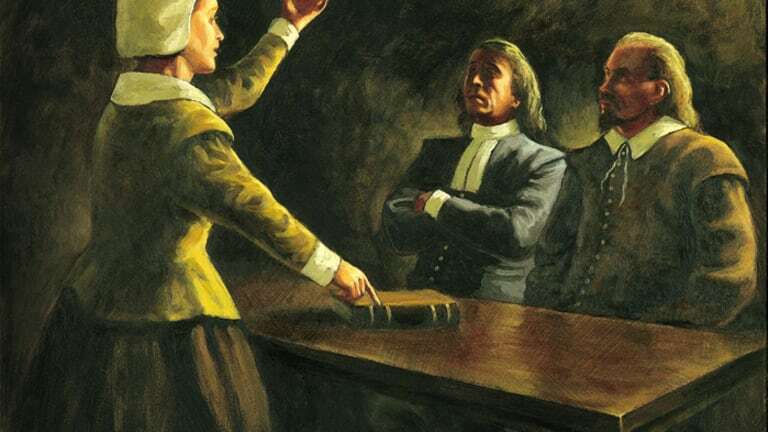 Anne Hutchinson was an influential Puritan spiritual leader in colonial Massachusetts who challenged the male-dominated religious authorities of the time. Through the popularity of her preaching, Hutchinson defied the gender roles in positions of power and gathered women into groups that threatened the male elders of the colony. 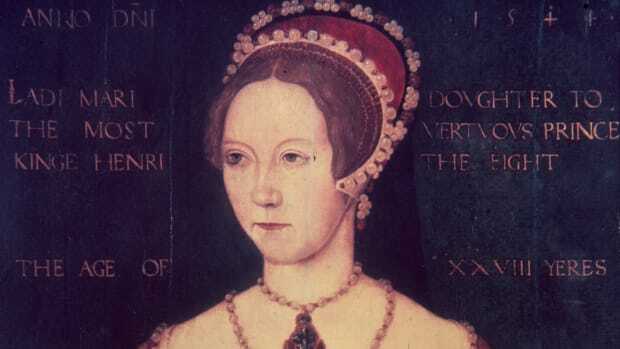 Anne was born in 1591 in Lincolnshire, England. Her father, Francis Marbury, was a Puritan minister who insisted his daughter learn to read. In 1578, Marbury was tried for heresy by the church after making repeated critical comments and was jailed for two years. He was again prosecuted for criticizing the church and was sentenced to three years house arrest the year Anne was born. After her father’s death, Anne married childhood friend and cloth merchant William Hutchinson in 1612 and began to work in Alford as a midwife and herbalist. 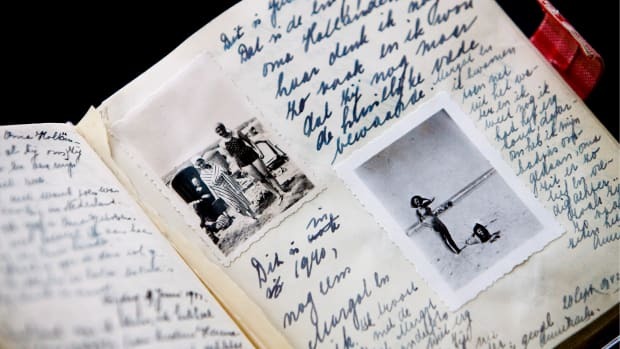 Around the same period, Anne started teaching Bible sessions in her home with other women. The Hutchinsons became followers of Puritan minister John Cotton, who preached that mercy is preordained by God, but damnation is determined by earthly behavior. Anne began to vigorously spread Cotton’s message to other women, with Cotton’s approval, since more women would often enter his congregation after following Anne’s persuasiveness. The ascent of King Charles I in 1626 led to the persecution of Protestants by the Anglican Church of England. 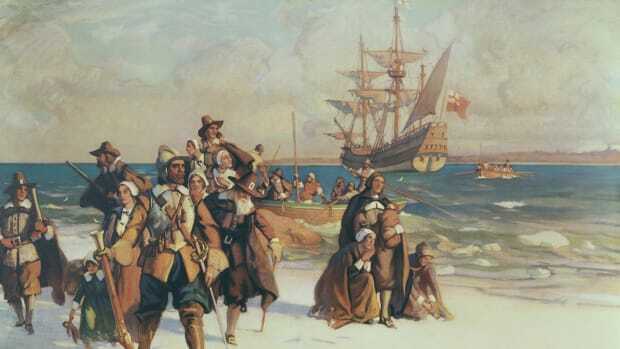 Puritans fled in large numbers beginning in 1630. The first of these included John Winthrop, future governor of the Massachusetts Colony. Cotton was questioned by the Court of High Commission over concerns that his preaching about church reform caused dissent. Cotton immediately went into hiding and fled to Boston in 1633. Believing Massachusetts was in opposition to the king, British authorities closed borders and stopped emigrants from leaving under threat of prosecution, and also made threats to Massachusetts. 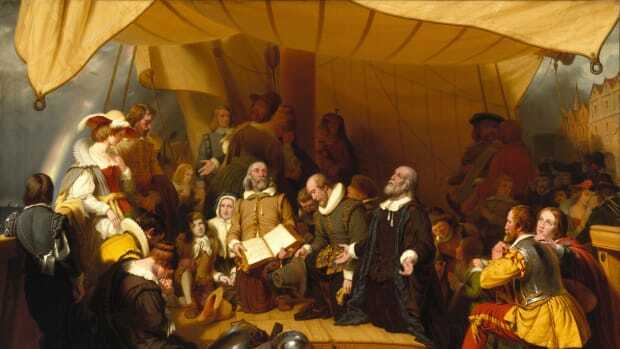 At the age of 43 in 1634, Hutchinson and her family, which included 10 children, dodged British authorities and joined Cotton in Boston in 1634, following Anne’s revelation to do so while reading the Bible. William Hutchinson rose to prominence in Boston, becoming a magistrate, while Anne joined with a group of women who worked as healers, treating illness and assisting in childbirth. Cotton immediately worked to cement his power in the new world and engineered the congregational structure of church worship, with Anne in his inner circle. It was during her involvement with the healing group that Anne developed the religious philosophy that became the focus of her American preaching. She believed that heaven was attainable to anyone who worshipped god directly, through a personal connection. Anne also preached that behavior, and therefore sin, did not affect whether someone went to heaven. These beliefs were in direct violation of Puritan doctrine. Anne expanded on her ideas in sermons and people flocked to listen to her, including men. By 1636, Anne was holding two meetings a week with as many as 80 people at each meeting, including Henry Vane, the governor of Massachusetts. After a year of preaching, Anne started to receive negative attention from the Puritan leadership who believed preaching was only for men and thought Anne’s ideas were dangerous. They also felt that Anne’s stance against sin could promote dissension in the colony and encourage people to refuse to work and act against church and colony rules. 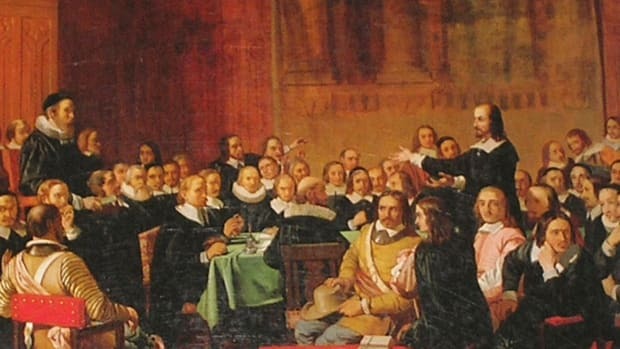 Those who rose up in opposition to her were the re-elected Governor John Winthrop and John Cotton, who feared Anne was becoming a church separatist. Both sent female spies to her sermons. Cotton gathered with other colony clergy to pass resolutions designed to end religious dissidence. One resolution specifically forbade meetings in Anne’s home – but Anne ignored the order. In 1637 Anne – several months into a pregnancy – was called to appear before the General Court, with Winthrop presiding and Cotton testifying against her. A debate over the next two days saw Anne performing well before the group of men when challenged on Biblical prowess, but her final argument sealed her fate. It was a lengthy statement of her philosophy and history, an account of speaking directly with God that concluded with a prophecy of the ruin of the court and the colony in retribution for their persecution of Anne. The men saw this as a challenge to their authority. Anne was proclaimed a heretic. She and her family were banished from the colony and any supporters in positions of authority were removed. All supporters were forced to surrender arms. Anne remained under house arrest until winter ended. In March 1638 the Hutchinson family, along with 30 other families, left for the island of Aquidneck in the Rhode Island territory at the suggestion of Roger Williams, where they founded Portsmouth. The men of the Massachusetts Colony didn’t stop trying to harm Anne’s reputation. After her pregnancy ended in June with the stillbirth of a severely deformed baby, rumors were spread that Anne had given birth to a demon, spurred on by Winthrop. Cotton preached that the stillbirth was her punishment from God. The defamation went beyond her own labor. One minister claimed Hutchinson had never delivered a normal baby as a midwife, that all were monsters. Governor Winthrop offered physical descriptions of many babies supposedly born to Anne’s followers as devil-like, clawed creatures. 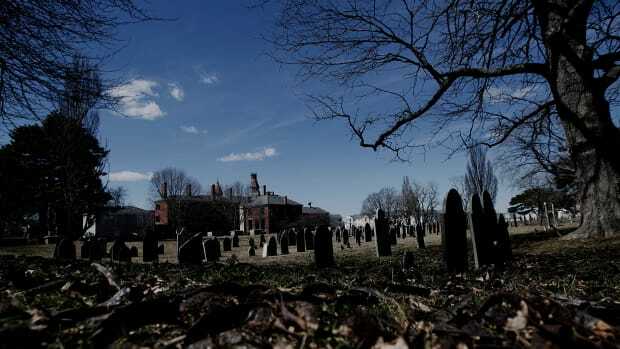 After William’s death in 1642, ministers from Massachusetts were dispatched to force Anne to renounce her beliefs and coerce her into believing that Massachusetts would soon take over the Rhode Island territory. 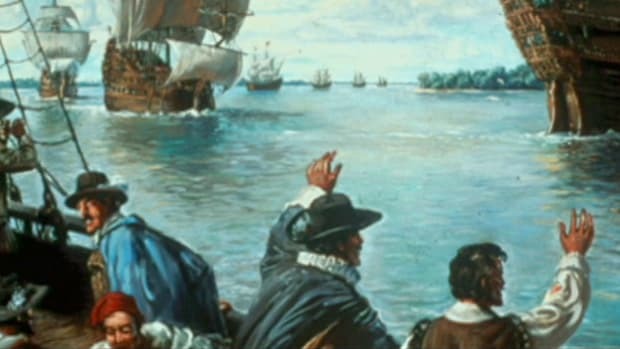 Wishing to escape Massachusetts’ meddling, Anne and her children moved to the Dutch colony of New Amsterdam (now New York City), homesteading on Long Island Sound. One afternoon in the summer of 1643, Anne’s family was attacked by Native American Siwanoy warriors at their home. Fifteen people including Anne were axed to death, their bodies burned. Hearing of Anne’s death, John Winthrop, who had never stopped monitoring Anne’s movements, expressed that his prayers had been answered and that an instrument of the devil had been dealt with justly. 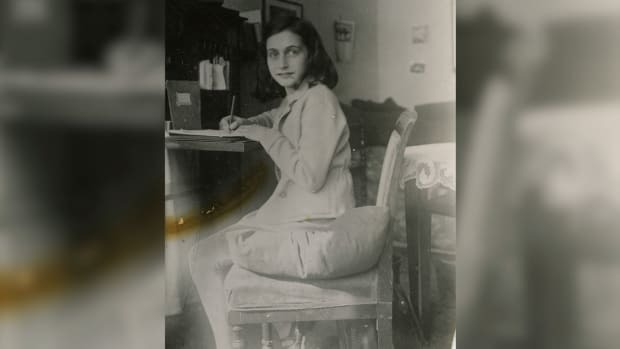 At the time of the attack, Anne’s nine-year-old daughter Susan was picking berries and hid behind a boulder. She was later taken captive by the Siwanoy and adopted by the chief, Wampage, who renamed himself ‘Anne-Hoeck,’ in Anne’s honor. Susan remained with the Siwanoy for another nine years, eventually returning to Boston and marrying a settler there. The adjacent river was christened the Hutchinson River, later joined by a major New York City-area highway next to it called the Hutchinson River Parkway. 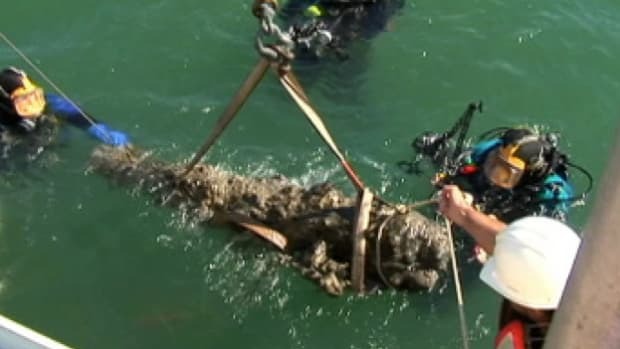 America’s Hidden History. Kenneth C. Davis.